I just got back from a short trip. I flew United. 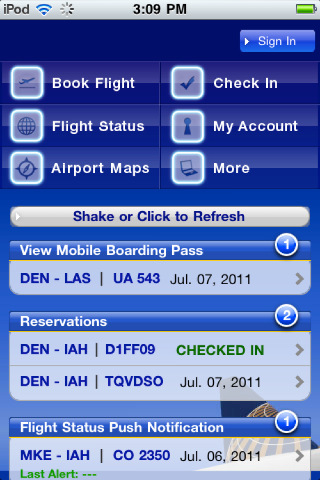 I used my app to check our flight status. Surely enough, the incoming plane was delayed by thirty minutes. Decided to spend the extra time in Nature wallowing in the beauty she has created – a dolphin frolicking in the distance in the warm sea – rather than in the Southwest Florida International Airport in Fort Myers suffering in the sterile concrete lump Man has created. After all, I’d already printed off boarding passes and even checked in baggage before arrival. Arrive at the counter and attempt to actually check in aforementioned bags. No such option was offered on the electronic check-in terminal. Find a wandering United clerk who repeats the procedure and encounters the same problem. She finds a higher-up United clerk who tries a third time. Then, the higher-up tells us that bags can only be checked in up to thirty minutes before the SCHEDULED departure not the ACTUAL departure. Luckily, sense is seen and baggage is checked in after some complaining. So, United expects you to make decisions as if the flight is leaving on time even though it is common knowledge that it is not. Then, why tell you flight status? If they do not tell you, you are more likely to make the decisions they want you to make. If they give you up to date information, you are certainly going to make decisions based on the information. Yes, you can find out the information via other websites. But then if you are late, can’t check in bags etc., it’s your own problem. If United has told you flight status and you’re late, then it’s their problem too. Surely, there is some footnote somewhere on some website that says you should be on time even if the flight is late but who’s going to read that? The process is frustrating, and yes, the airlines do expect you to be there at the scheduled departure time rather than the actual departure time. In fact I’ve seen situations where flights are delayed “at least” 2 hours and yet departed only an hour later, and according to the airlines it is the traveller’s responsibility to be in the terminal the entire time for that very reason. Quite annoying. That is also accepted sometimes as their buy out music and songs library. When you appreciate music from other cultures, you have fun with your collection far better. be intended by gaming creative designers, and some of which may not be intended. its bastion in the European countries although many of the major purses are in the US as certain nations only allow 1 version of the sport to have fun with subsidies or funding assistance. United Airlines Flight Status Warning | Cheap Talk. some of the comments come across like they are left by brain dead visitors? 😛 And, if you are posting on additional social sites, I’d like to keep up with anything fresh you have to post. For large group policies, insurers are required to spend 85 percent on medical care and 15 percent on administrative expenses such as advertising and profit. Like I had mentioned earlier, turmeric is a powerful anti-inflammatory.